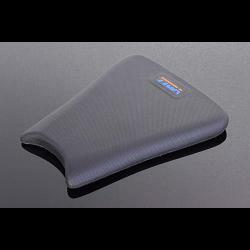 Vinyl covered medium density foam race seat pad provides a maximum amount of feedback from the bike and minimum comfort! Underside of seat has velcro stitched in. Kit is supplied with a strip of Velcro with strong 3M adhesive tape applied on the underside. Easy installment. Cut the strip to size using scissors, one each side recommended. Then simply peel back the protective layer on the adhesive strip, lay the strips on the seat cowling and place the seat pad in position. FREE SHIPPING by Airmail* if ordered individually (please allow two weeks delivery from date of dispatch) and FREE SHIPPING by EMS and UPS if sent with other products as part of a bigger order. Notify me of updates to Seat Pad, GP-T Assy.